Lake Elementaita, Nakuru County, Kenya. Dec. 2015. 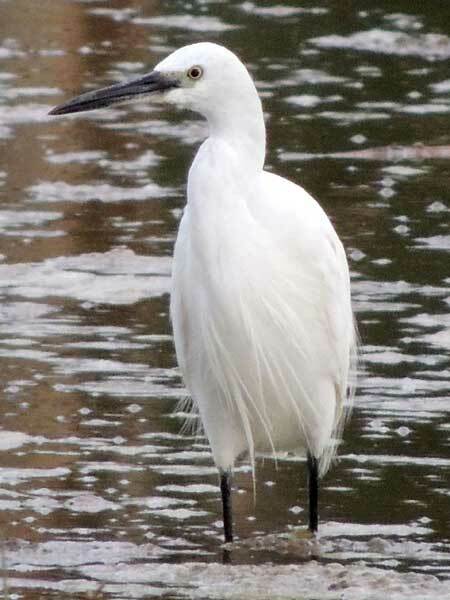 From Wikipedia: The adult little egret is 55–65 cm long with an 88–106 cm wingspan, and weighs 350–550 g. Its plumage is normally entirely white, although there are dark forms with largely bluish-grey plumage. In the breeding season, the adult has two long plumes on the nape that form a crest. These plumes are about 150 mm (6 in) and are pointed and very narrow. There are similar feathers on the breast, but the barbs are more widely spread. There are also several elongated scapular feathers that have long loose barbs and may be 200 mm (8 in) long. During the winter the plumage is similar but the scapulars are shorter and more normal in appearance. The bill is long and slender and it and the lores are black. There is an area of greenish-grey bare skin at the base of the lower mandible and around the eye which has a yellow iris. The legs are black and the feet yellow.